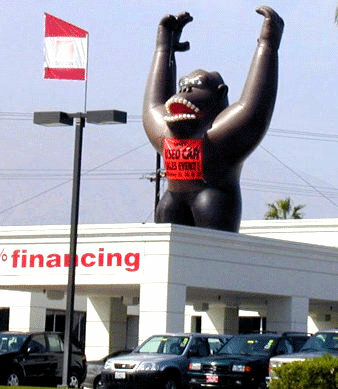 A study sponsored by the General Office of the National Association for Dealership Studies shows that giant inflatable gorillas on dealership rooftops can increase car sales by up to 14%. Monthly noted that not all dealers with giant inflatable objects on the roof saw the same results. While the presence of a giant inflatable gorilla may seem moronic and patronizing, the big air-filled primates do appear to resonate with consumers. Michelle Serious-Blister, a 25 year old receptionist from Passingzone, Wisconsin, said the inflatable gorilla perched atop her local Ford dealership was a major factor in her purchase decision.